An architectural masterpiece, like any masterpiece, gains in meaning and enriches its owners and its community. The joys of an architectural masterpiece are its long lasting lessons and beauty. Such distinction belongs to the A.D. German Warehouse, said to have been designed in 1915 by Frank Lloyd Wright, located in Richland Center where Wright was born in 1867. This building is one of Wright’s architectural gems listed on the National Register of Historic Places in Wisconsin, (NRHP 1974). It is the only warehouse designed by Wright and was built during the period of 1911-1924 which also included the famous Imperial Hotel in Tokyo and Midway Gardens in Chicago. 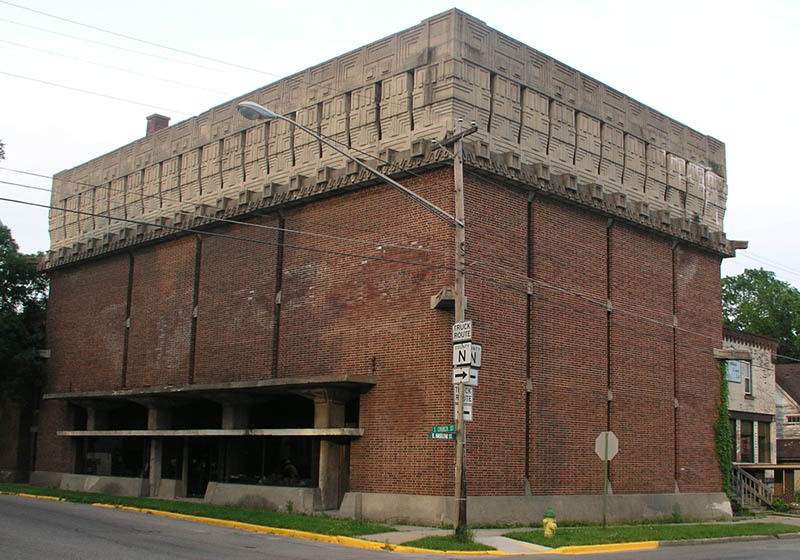 The A.D. German Warehouse is an impressive brick structure topped by a magnificent concrete frieze. Generally considered to resemble a Mayan Temple, this avant-garde warehouse and attached music room was built for A. D. German’s wholesale grocery business. It employs a unique structural concept known as the “Burton Spider-web system.” Significant as an example of early poured concrete construction, the building rests on a pad of cork for stability and shock absorption. Wright used concrete slabs for the floors supported by concrete columns that grow smaller in size proceeding upward to the fourth floor. Construction was stopped with the building unfinished in 1921, after spending $125,000, which exceeded the original cost estimate of $30,000. It is the only remaining commercial structure designed by Wright that still exists from this time period. As time passes, its architectural and historic significance continues to grow, reaching far from its location on the corner of Church and Haseltine Streets in Richland Center. The building will now be reimagined, using Wright's design principles, to serve as an economic development tool for Richland Center, Richland County, and the entire Driftless Region. Each floor will have a specific purpose designed to bring people to the region- heritage tourism advocates, entrepreneurs, and those whoe enjoy working, dining and shopping in this unique space. For more information visit www.adgermanwarehouse.org, call (608) 604-5034, or email larbegust@gmail.com. Open to the public on Sundays, May through October, 10 am - 2 pm, other times by appointment. Docent guided tours on the quarter hour.